I started this quilt two years ago when my lovely friend was struggling to conceive. After a conversation where she had confessed that she couldn't wait till I could make something lovely for a future baby of hers, I thought it would be nice to make something sooner, something that would remind me, while stitching, to pray for health and peace and patience, and a new little one for them. The pattern is Rachel's Modern Medallion, from Stitched in Color's Handstitched Class and each round of the medallion includes a different handstitching technique. I highly recommend Rachel's classes! Well the more I stitched, the less I was convinced that it was my friend's style. Isn't it challenging making for others, without completely second guessing yourself? I replaced the centre with something different to my original choice, I chose brighter colours than the earlier rounds of Loulouthi which are very 'autumn'. Still, I was unsure. And then, miracle of all miracles, she fell pregnant! And slowly but surely, the quilt became neglected while I dreamed up fun and sweet baby gifts. She had stayed in my "I don't know what to do with you" box for about a year, when I found out my cousin, another quilter and Anna Maria Horner appreciator (I like to think I introduced her), found out at her 20 week pregnancy scan that her baby was high risk, his organs weren't forming properly, and she needed to prepare for the worst. At the beginning of my own pregnancy with Finlay, I was devastated for her. I decided the best thing I could do was bring out the quilt again and keep praying. Following surgery immediately after birth, Naomi's baby stayed in hospital for 2 months before, miraculously, wonderfully, she was able to take him home. You can read her honest and beautiful story here. I've told a couple of people while showing them this quilt, that I was making this for my cousin. "She must be a pretty special cousin!" has been the common reply. And she is special, and I do like her a lot, but I don't think the recipient of a quilt can be valued by the time put into it. 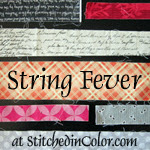 Sometimes it feels more like a gift to the quilter, wouldn't you agree? Thousands of kilometres away, little old me with my 3 kids and small house, can do this one thing that's extra special. I used to be the person wishing I knew how I could help, wishing I could do something. Now I can do this. Something that can hopefully, humbly, be a physical expression of all those hopes and prayers and tears, given for that precious little boy. And the much longed for little boy born to my friends last year. And for other dear friends and their wishes for babies and partners and other things that haven't come along as easily as they hoped. Yes, I do love handstitching. It was five years yesterday since I became a mum. We spent the day yesterday celebrating Tully's birthday, but today I've been reflecting on the anniversary. I don't think of it often, because it makes me uncomfortable, the way that supposed-to-be-precious day went from the photo above to the one below. They say those first moments make all that came before it fade away. Instead, I looked at this little alien and wondered where the heck he came from. The alien and I got to know and love each other slowly, rather than experiencing any fierce, instinctive wave of emotion. And if there's one thing I'm thankful for, it's that I decided just to ride it out, be with it, rather than fear that something was wrong. And the more he's grown up and I've grown up, the more we like ourselves and each other. A few weeks ago, Tully exclaimed in a sighing kind of way, "Oh, I just love our family!" And I realised that I did too. That they didn't feel like aliens to me any more, but part of myself. And I realised that deep down, that's what we all long to feel. That we love the unit we belong to. And that my role was to enjoy him and help him discover all the good parts of himself. I've been trying to think up a poem for Tully over the last few weeks, but nothing has really been coming to me. Then one of our friends gave Tully "Oh the Places You'll Go!" by Dr. Seuss. Have you read it? We did last night before bed, and it expressed exactly everything I'd love Tully to know and feel about the world. And on it goes, with just the right tone of realistic optimism, communicating that it's good and right to hope, especially when your expectations are dashed. That the ups and downs are all part of the adventure of life. It's great isn't it? And God help me equip him to face life like this. Because sometimes there are unplanned pregnancies, and unplanned caesareans that change life forever. And some surprises will bring unfathomed grief, and others, an adventure you can only enjoy if you dive in, shoes and all. A quilt for moving on. It was in the aftermath of all the change and grief earlier this year, that this quilt was born. In the small, silent privacy of my new sunroom studio. When the repetition and attention and clear, quiet whites and greys, and just a touch of blue were having a tangible effect on my soul. I had brought out my neutral bucket of scraps, (I couldn't imagine working with colour), fished around for the strips, then grabbed the leftovers from my Children at Play pinnies, and the linen ones, and the 'white on white' prints that I had used for a custom order quilt last year and never looked at again. I think it was the memory of that quilt, warm, calm, traditional, that made me feel grounded. And I wanted to create something like it again. My first log cabins were very intentional. Each piece sewn and ironed and trimmed with care and design. And then (as I wrote here), as that lost its therapy, I started to chain piece. Then, more recently, as I started to feel more myself, I began introducing more pops of colour. More flat solids and less tone on tone. More modern prints and less care whether it matched. I finished up all the 8" blocks and laid them out on the floor of my friends' house to ask what she thought. I had planned to make different sized blocks and have them scattered throughout. But the regularity of the squares made such a simple, pretty baby quilt. Cath said to me, "That's pretty, but the other one you have in mind will be wonderful." I'm so thankful now for that encouragement. It gave me the extra little push I needed to keep going when I felt like finishing up there. I felt the shift from this being all about safety (which was just right in the beginning) to realising I was in a place again where I could go beyond my natural attention span, or motivation, to create something I really wanted. And it feels good to be here again! I'm joining in 'Festival of Strings'!